This post and my DIY sangria bar has been sponsored by Mija Sangria. Thank you so much for supporting my blog! Hello from my wonderful Maine vacation! I’ve been having a glorious week with my family, enjoying beautiful weather, Maine beaches and lobster, hanging with my nephews, and so much more. Also, a cocktail or two. Isn’t that what summer vacations are all about? 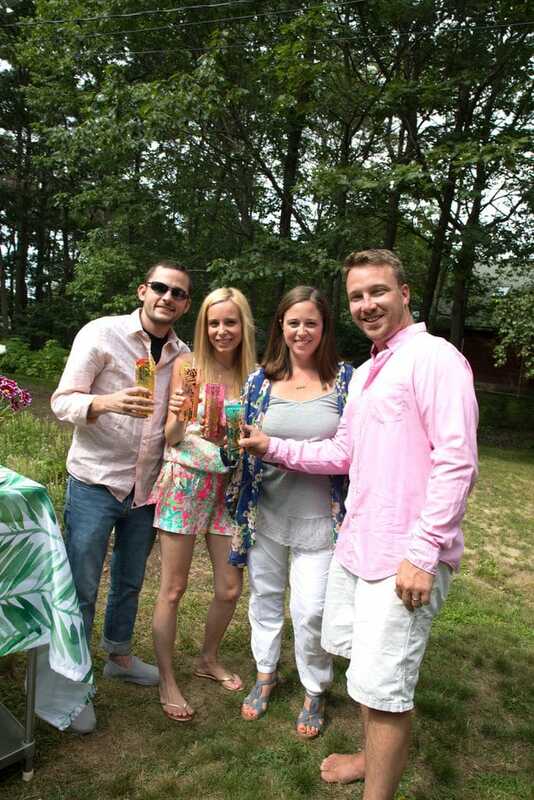 This summer, I had the opportunity to team up with Mija Sangria, so I packed up my sangria supplies and brought them to Maine to set up a DIY Mija Sangria Bar during our vacation week. The sangria bar occurred during nap time, but my nephews were very intrigued by the set-up. They love fresh fruit and juice, so it felt almost cruel to leave them out of it (they were also peering out the window at us when they should have been sleeping), but they still have a good 18 years before they can join in on the sangria fun. Sorry, bud! 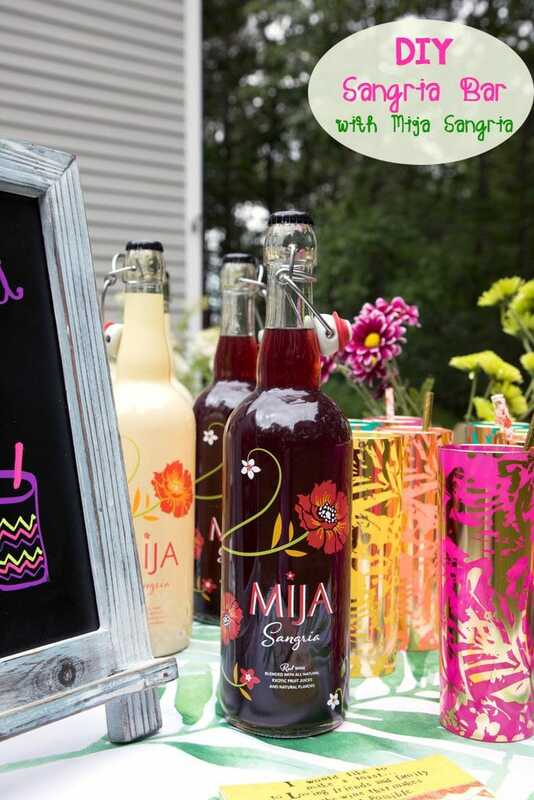 Mija Sangria is a natural bottled sangria made with premium wine and 100% real unfiltered fruit juice (including pomegranate, açaí and blood orange) for a homemade taste. It comes in both red and white (new this season!) versions, both of which I had at my DIY sangria bar. 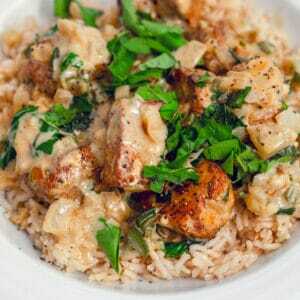 It’s also gluten-free and has 3 times as many antioxidants as a glass of red wine! Mija is perfect for bringing on trips since it’s basically instant sangria and comes in a flip-top bottle. You really don’t have to add anything but ice to Mija, but if you’re like me, you always want fresh fruit in your sangria. I kept the DIY sangria bar simple with a variety of fresh fruit and sparkling water for anyone who likes their sangria with bubbles. But in my mind, you can’t have a sangria bar without some fun accessories, like glasses, straws, and napkins. Hint: Oh Joy! 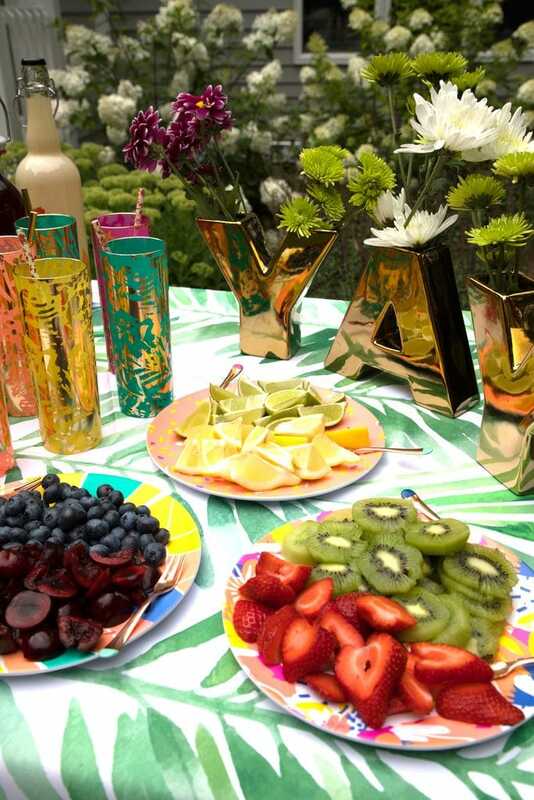 for Target has the best DIY sangria bar accessories around. I’ve always been in love with Oh Joy! but especially for summer parties. Thanks to my sister’s fab artistic skills and decorating the pretty Sangria Bar chalkboard (my handwriting leaves much to be desired). 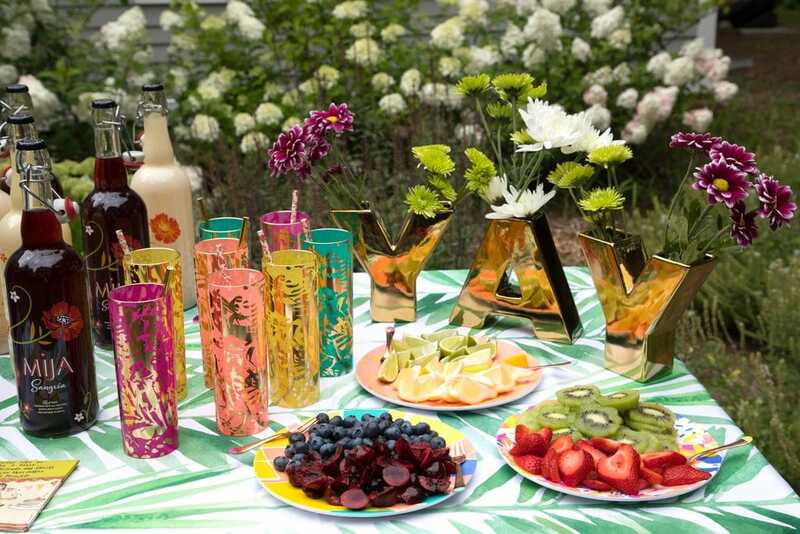 And have you ever seen more appropriate vases for a sangria setup? 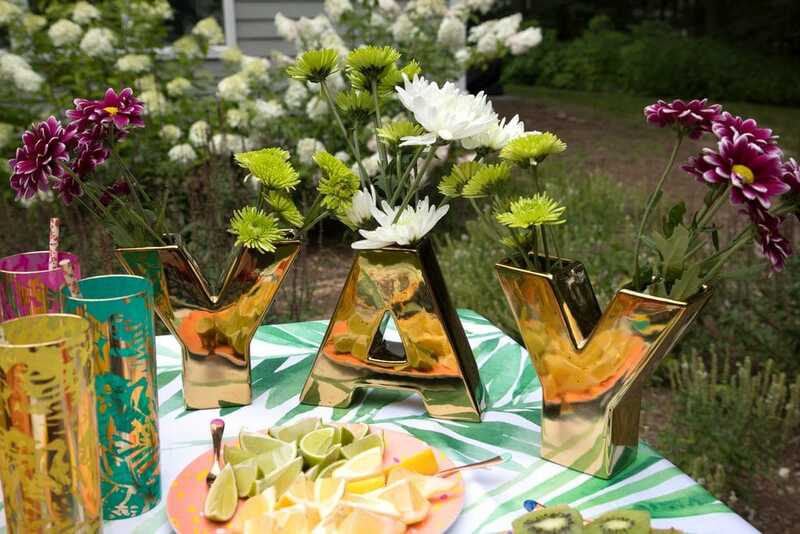 “Yay!” is exactly how I feel about sipping on Mija Sangria on my vacation. Another fun fact? At 9.5% ABV, Mija is one of the highest-proof sangrias you’ll find on the market. Happy summer! 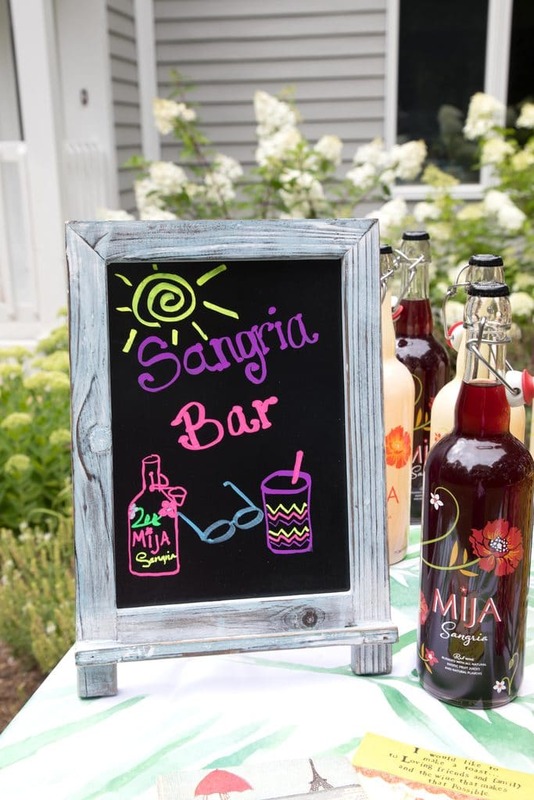 I love how Mija makes it so easy to have a sangria bar on the go! After a long hard day at the beach, we were all more than ready to sip on some sangria. We filled our glasses up with ice, Mija Sangria, and a whole lot of fruit. I’m usually very much a red sangria drinker, but I actually loved Mija’s white sangria. With guava, orange, lime, and lychee juices, it has a fun tropical taste to it. I added limes, cherries, blueberries, and kiwi to my sangria. But everyone did something a little bit different. 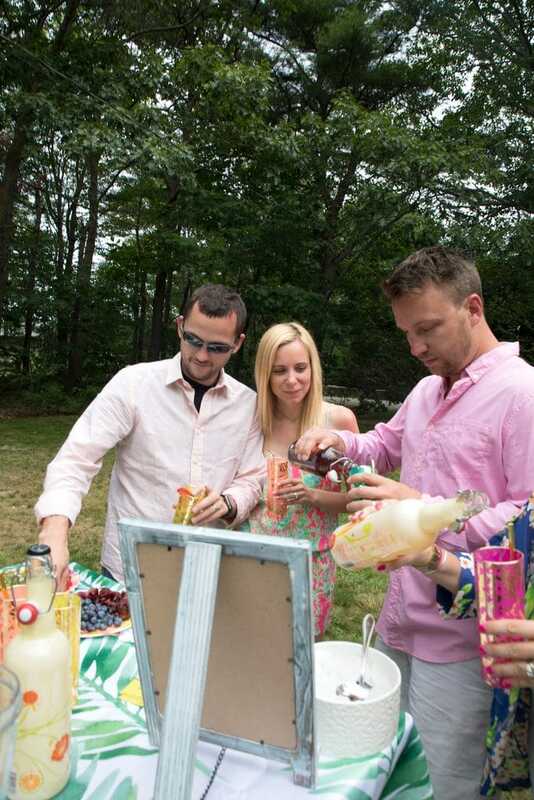 Which is the best part of setting up your own sangria bar. I don’t buy a lot of “pre-made” cocktails, but was really impressed with Mija. It’s made with 100% fruit juice and not overly sweet, which I’ve found is often a problem with other pre-made cocktails out there. It’s perfectly balanced and really doesn’t need anything added to it. 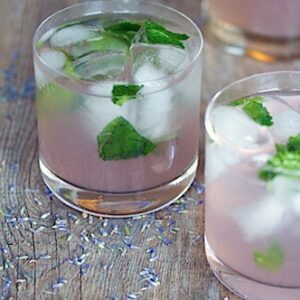 Of course, if you want to go wild, you could also add other liquors to your sangria bar or even sparkling wine instead of sparkling water. The options are endless! Cheers to an awesome summer vacation with all the sangria we want. At any time of day. How on Earth am I going to go back to the real world next week? Luckily, I have another bottle of red Mija and another bottle of white Mija that I’ll be bringing home with me. Something tells me I’ll need to set up another DIY sangria bar next weekend! 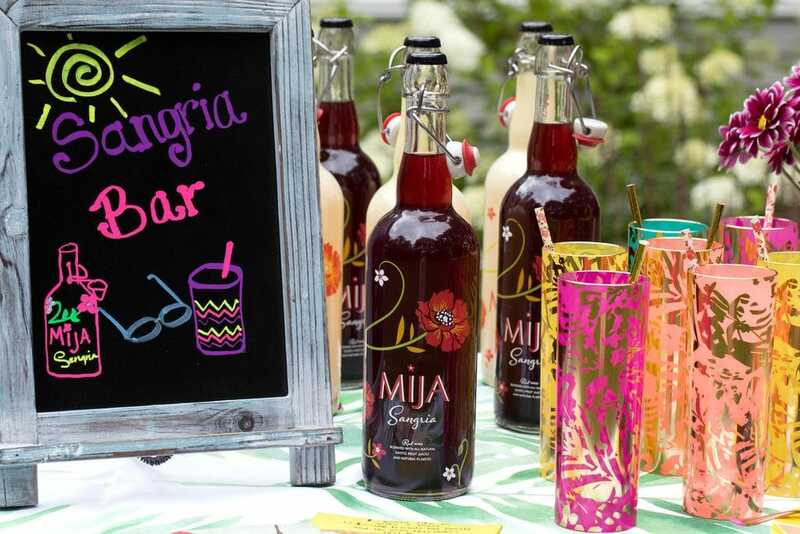 Also, keep in mind that you can purchase Mija Sangria online! There’s still plenty of summer left to enjoy your own sangria bar! Remember, fall doesn’t start until mid-September (and fall sangria is some of the best around, anyway!). What’s in your ideal glass of sangria? 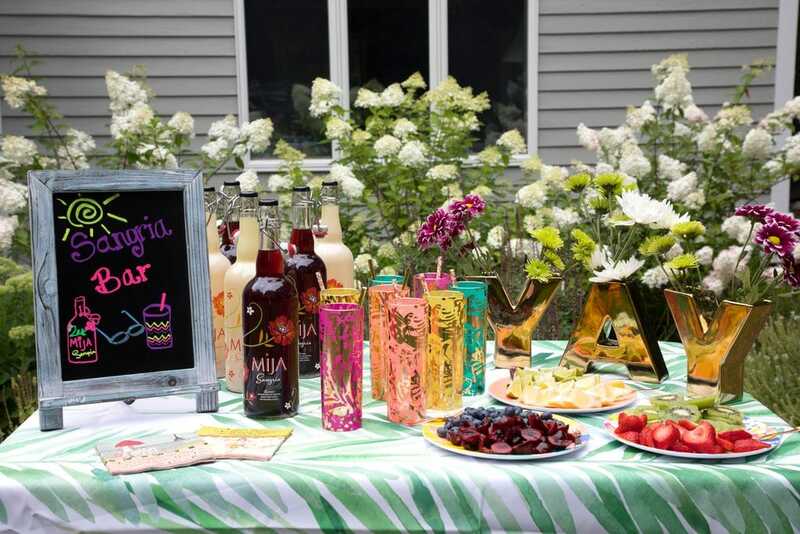 15 Responses to "DIY Mija Sangria Bar"
I love the idea of like a drinks buffet. This would be perfect for a summer garden party! 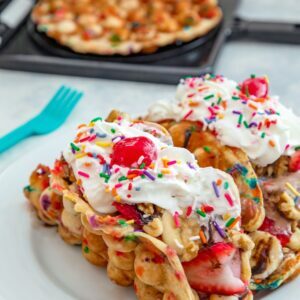 This is such a fun idea for parties! Ah, Sangria reminds me of childhood holidays to Spain ( where the attitude to alcohol is very different – it’s legal for children to drink a little alcohol at home, just like here in the UK!). I Love your novel DIY approach – it’s why I like things like tacos so much, everyone can build something different, rather than the ‘as it comes’ pitchers that you get in Spain. How fun! I’ve never heard of this brand. I’m going to have to look around for it. I’m glad you had fun on your vacation in Maine. It is a glorious state! 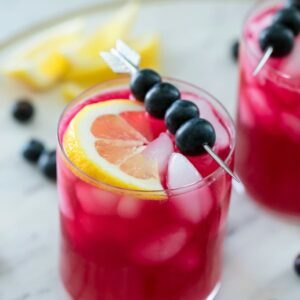 I LOVE sangria and I love your idea! So much fun! Such a fun way to celebrate with friends and summer! 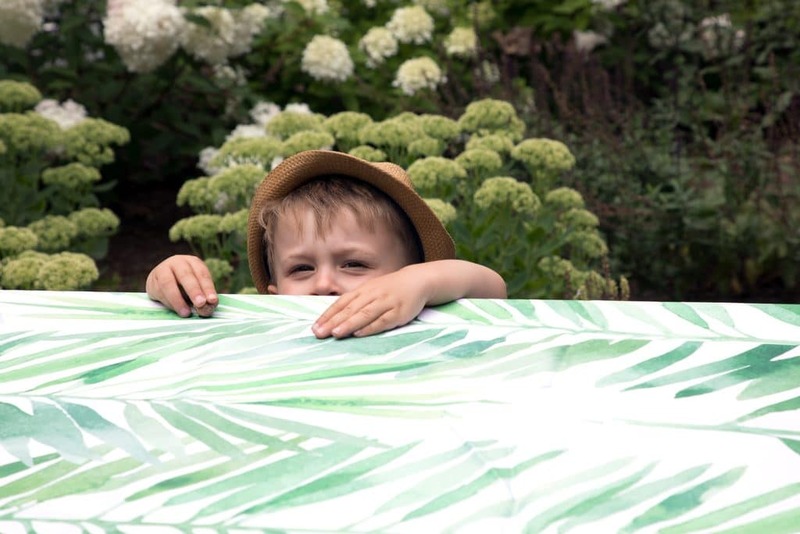 This is such a fun idea for all those outdoor parties during summer. Love! This is so fun! 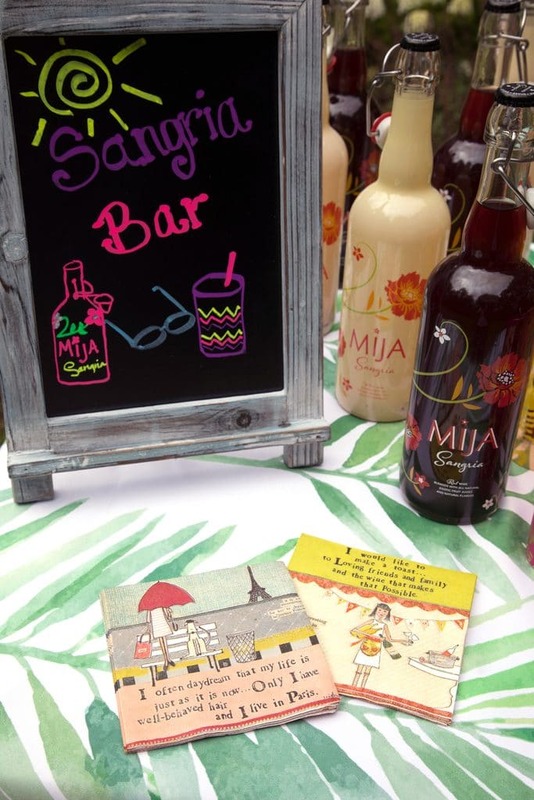 I’ll have to look for Mija–a sangria bar would be perfect for Labor Day! Glad you’re having so much fun! So much fun! Lovely setup and Sangria bar is just perfect for the weekends! Maine is so lovely! Enjoy! And my sangria definitely needs fruit – but it’s good to have one ready to drink for vacations and picnics! This is too fun!! I would love to do one of these for a bunch of girlfriends in the backyard 🙂 PS – Maine looks gorgeous! !